We saw Michael Moore's latest movie at the community hall last night. Where to Invade Next is quite brilliant and I highly recommend it. There wasn't much in it that I was unaware of (the big hearts of Norwegians took me by surprise), but his premise and the things his interviewees had to say were really evocative -- and provocative. don't give a flying leap about climate change. I don't know when Canada's neighbour to the south adopted this ethos of inhumaneness, though I suspect it coincided approximately with when Exxon decided to withhold its scientists' knowledge of climate change and start funding denial. I do know this. We need people to be afraid, very afraid. Of the climate change emergency, not each other and certainly not people in uniform. 1. 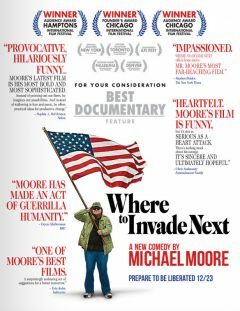 Watch Michael Moore's Where to Invade Next. 2. Do what you can to end the brutality, the inhumanity, and the what seems like complete lack of sensitivity in America. Let's encourage Americans to bring some heart and humaneness back to their country. 3. Help any friends and relatives you might have in the US (and elsewhere) see that it's no longer "us and them," it's now us and us. We must work to find common purpose -- and that focus must be climate change. We're all on the same side now! Julie, Watch Chomsky's Requiem for the American Dream to see where America's greed and corresponding indifference to others came from. It was built into the Constitution and has continued ever since.